Japan: International Medical Researchers Issue Warning about HPV Vaccine Side Effects - SaneVax, Inc. The International Symposium on the adverse reactions experienced by girls who have been vaccinated by Human Papillomavirus vaccines and subsequent events which took place in Tokyo on February 25th and 26th have sparked a high-profile debate over HPV vaccine safety, efficacy and need. The Researchers’ Organization Sounding a Warning concerning the Adverse Reactions induced by Human Papillomavirus Vaccines, led by Dr. Harumi Sakai, a former professor of Tokai University, School of Medicine and a former leader at the immunochemical research team at Texas University, Galveston, reported that Sin Hang Lee, MD, former Associate Professor at Yale University and currently pathologist of Milford Hospital, Dr. Francois Jerome Authier, MD, a professor at Universite Paris XII and a doctor at Systeme Hospital Henri Mondor de Paris, and research fellow Lucija Tomljenovic, a PhD from the University of British Columbia, presented evidence regarding the risks involved with HPV vaccines during the symposium, two press conferences and a government-sponsored public hearing on February 26th. The public hearing was attended by eight medical academic members of the Japanese government’s Advisory Council on the Alleged Adverse Reactions to HPV Vaccines, several top-ranking Health Ministry bureaucrats, medical doctors and journalists from the nation’s major newspapers and television networks. The non-Japanese academics and Dr. Sakai presented scientific data supporting several biologically plausible mechanisms of action by which HPV vaccines could cause devastating autoimmune and auto-inflammatory conditions whose symptoms are identical to those reported by HPV vaccine recipients in Japan and around the world. 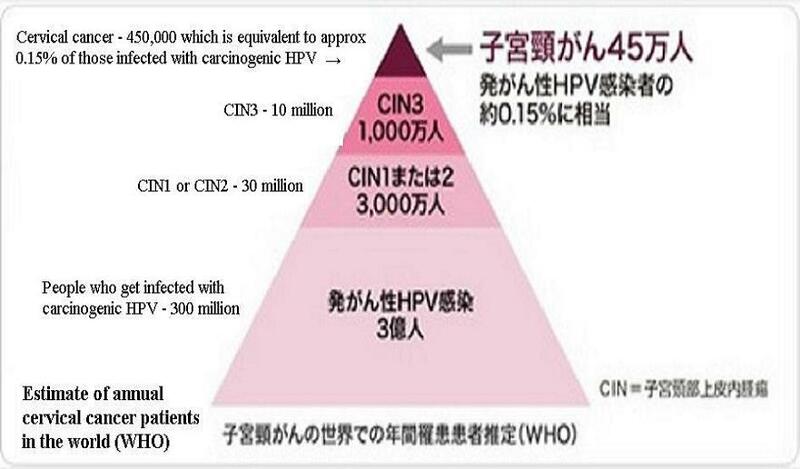 The scientific information presented by the medical experts at the public hearing and news conferences may help Japanese lawmakers and other policy makers make right decisions and put forward recommendations concerning the future of the current HPV vaccination policy program for the best of their citizens. The current official theory that the government relies on to explain the numerous reports of serious symptoms among the teenage girls vaccinated with the HPV vaccines — Gardasil and Cervarix — was published in January by the Ministry of Health, Labor and Welfare. But Dr. Sin Hang Lee said even if the government seeks to explain away the adverse reactions experienced by these vaccinated girls as psychosomatic reactions, such theory cannot be deemed logical and scientific. Dr. Lee noted that no scientists at the Feb. 26 public hearing — at which he reported his detections of HPV DNA fragments in 16 unopened vials of Gardasil sent to Milford Medical Laboratory Inc. from nine countries and in the postmortem blood and spleen samples obtained at the autopsy of the 18-year-old New Zealand girl who died after Gardasil vaccination — could raise their hands when he asked them to do so if they believe that psychosomatic reactions can cause sudden unexpected death in sleep among young girls or cause the clearly visible lesions captured with the magnetic resonance imaging (MRI) method as well as the histopathology lesions reported in patients of post-Gardasil acute disseminated encephalomyelitis (ADEM) and multiple sclerosis. When Dr. Lee referred to the lesions demonstrated by the MRI method and by the pathological photographic evidence of inflammation in the brain of a 16-year-old Connecticut girl who has lost her vision completely since the 10th day from her second Gardasil shot in 2007, he was speaking on behalf of the treating physician, Dr. Mirna Hajjar who was also present among the audience at the Tokyo public hearing. The photomicrographs were taken of the biopsy of her brain by a medical doctor of a research team led by Francois DiMario, MD, Mirna Hajjar, MD and Thomas Ciesielski, MD (the University of Connecticut School of Medicine, Farmington, Connecticut, and the Departments of Pediatrics at Connecticut Children’s Medical Center, Hartford, Connecticut; and the Department of Neurology and Pathology at Hartford Hospital, Hartford, Connecticut). The photomicrographs of the brain biopsy demonstrated demyelination and a vessel cuffed with lymphocytes and surrounded by infiltrating macrophages. Dr. Hajjar who played a crucial role by giving her courageous scientific testimony at the Tokyo news conference on Feb. 26 is one of the three coauthors of the medical report which appeared on the Journal of Child Neurology. “As a pathologist, it is my duty to find plausible mechanisms of action for sudden unexpected death and unexplained acute disseminated (demyelinating) encephalomyelitis after HPV vaccination, and I have proposed such a scientifically plausible mechanism based on known DNA transfection by nanoparticles of aluminum/ DNA complexes. The opposing opinion (against my position) is that all symptoms and signs manifested by the post-HPV vaccinated girls were the results of psychosomatic reactions. I asked the scientists at the public hearing to raise their hands if they really believe that psychosomatic reactions can cause a sudden unexpected death in sleep and a brain inflammation. The term “transfection” used in Dr. Lee’s testimony means a process of introducing foreign DNA into human cells by non-viral vehicles, such as the aluminum/DNA complex nanoparticles. The debate over HPV vaccination policy in Japan is not finished. One set of participants led by Dr. Lee and Professor Authier has proposed scientifically plausible mechanisms of action. The other side declared in the Japanese government document that these events are the consequences of psychosomatic reactions. However, these foreign scientists and some Japanese intellectuals have demonstrated their courage by becoming catalysts with which the HPV vaccine-related health issue was debated for the benefits of the general public with nationwide media coverage. Let’s hope politicians and intellectuals worldwide follow their example and take actions that could cause similar scientific debates to be held in their own countries to defend and save the future health of millions of teenage girls. Let us hope that scientific evidence will outweigh the psychosomatic theory which may be threatening to mislead the general public worldwide into attributing all symptoms at vaccinated girls to psychological problems on the part of vaccinated girls. If theories similar or essentially identical to this irrational and irresponsible theory were allowed to proliferate across the world with no conscientious scientists or intellectuals stepping forward to refute the pseudo-scientific theories, the health of many more young people could be devastated. Read the French translation of this article here. > The debate over HPV vaccination policy in Japan is not finished. I don’t know how much MSD paid him but that accomplice of 9/11 inside job (Listen to a victim’s father Bob McIlvaine) came over to Japan to emphasize that it’s important to cancel that temporary halt of the (fake) Governmental recommendation of HPVV. A (fake) politician Junko Mihara, a determined supporter of HPVV was so happy to see him. and I can clearly see that it’s a VERY GOOD business for insurance companies, who are selling insurance to local (fake) governments to cover the expense, though they never pay anything to victims, I saw a very interesting pdf of a thesis. Actually, it’s very DISGUSTING cause it’s based on that lie, “HPV is the cause of cervical cancer” to begin with. Again, I say HPV is NOT the cause of cervical cancer at all. Give everybody this WHO figure!! Japan: International Medical Researchers Issue Warning about HPV Vaccine Side Effects – SaneVax, Inc.